Happy Monday to you! 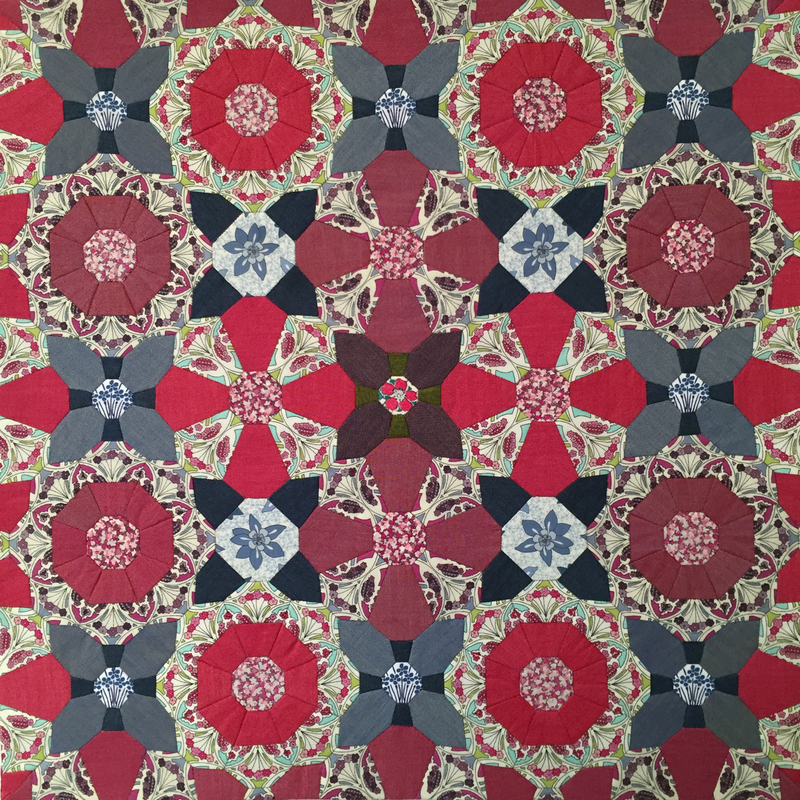 In an uncharacteristically short post (my interlude with brevity is only likely to last a day - normal loquacious service will be resumed shortly), I just wanted to let you know that my English paper piecing patterns all have 15% off this week - just use the code SUMMER at the checkout until 31st July. Find them here, here and here. Thank you so much for all your thoughts on my last post - it was comforting to know that so many others out there were feeling similarly crestfallen. If you're still feeling glum, do have a look at Nina's comment, which includes some proactive and positive suggestions. 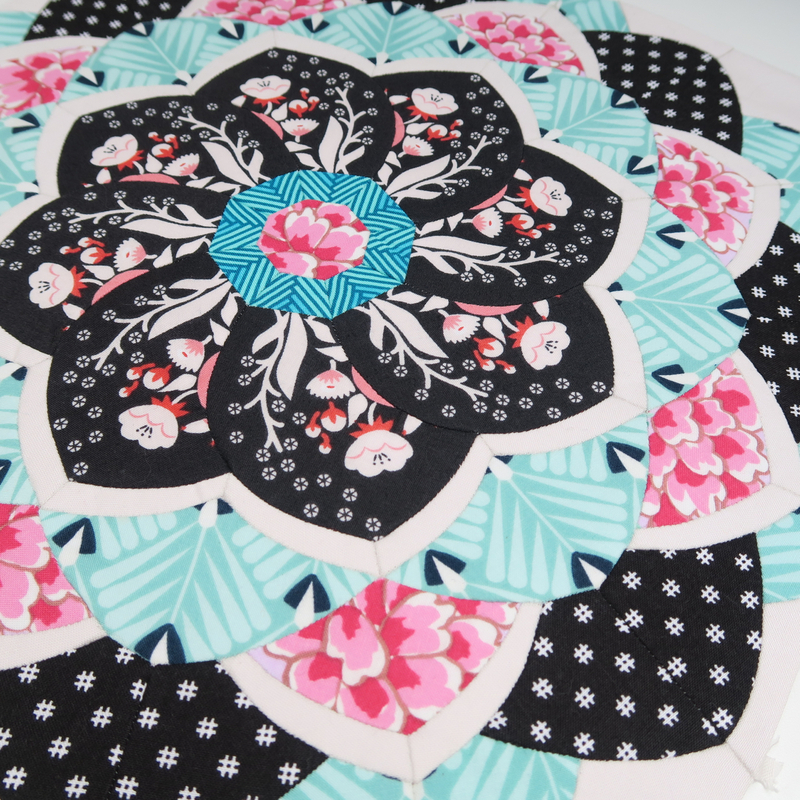 Returning to some sewing, look at these gorgeous flowers, above, that Cvitron has been creating using my Perpetual Spring EPP pattern! It quickly became apparent watching Christine's Instagram feed that there were more whole flowers accumulating than are needed to make a wallhanging, so I'm excited to see this pattern made up on a grander scale than I've attempted myself! 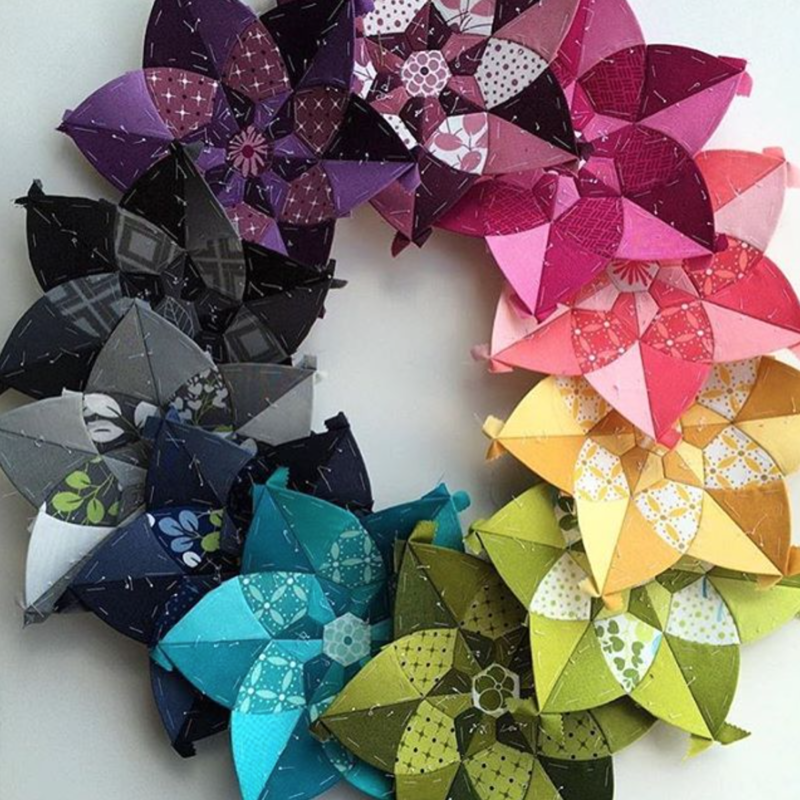 Any thoughts that English paper piecing is a slow process will be dispelled looking at Christine's progress - you can see more of her gorgeous work over on Instagram. 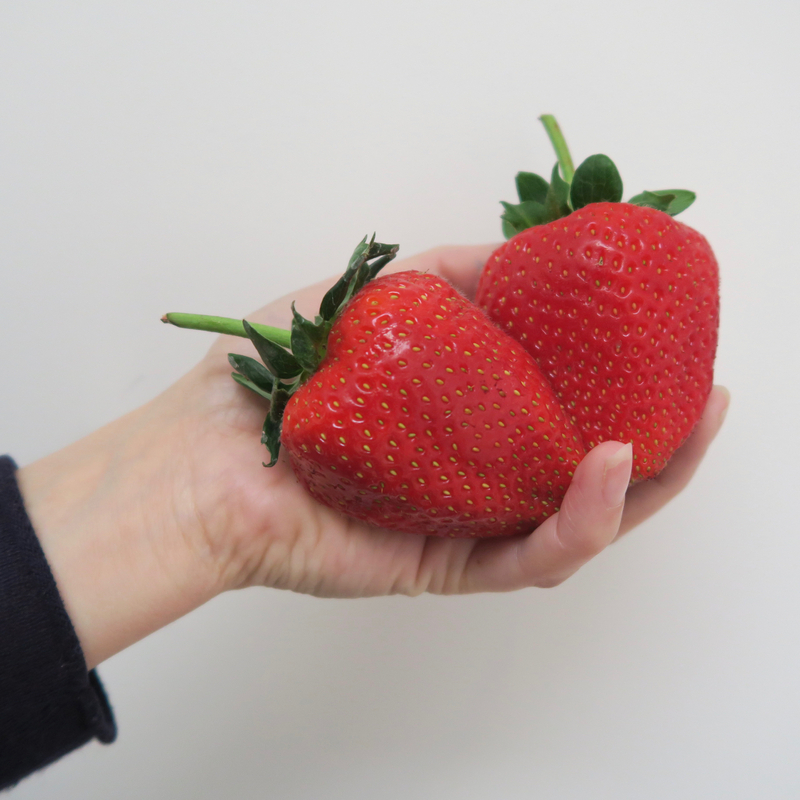 In other matters, I have been eating absolutely vast strawberries this week - look at my hand for scale! Aren't they amazing?! And they had none of the usual blandness that can come with larger strawbs, but rather, they were the juiciest, sweetest things imaginable. I would very much like to say that I grew them myself, but I shall refrain from letting my farm girl aspirations influence my ability to write truthfully. There are a huge list of fruits that I can't eat due to food intolerances although strawberries aren't one of them, but I have been avoiding them for the last few years simply because they make my teeth feel too sensitive when I come to brush them later (which has always seemed odd, as I don't suffer hot/cold/sweet foods tooth sensitivity...it's just fruit). Anyway, I have recently changed my toothpaste and was delighted and amazed to find that I can now eat strawberries with no pain at all. Any small new addition to the 'Things I Can Safely Eat' list is nothing short of life changing for me, so I'm thrilled. Without wanting to seem like a toothpaste advert, if you're interested, it was this one, bought only because the shop I was in didn't stock my usual Sensitive toothpaste and we were running out, but I will now buy it in industrial quantities. Fellow dressmakers may be as blown away by this tiny video from Colette Patterns as I was, which shows how to turn a strap in less than 30 seconds, with none of the usual sweary wrestling match. I want to make something with tiny straps now so that I can experience the joy of this first hand. If you'd like something wonderful to listen to while you're sewing this week, then I'd really recommend listening to the surgeon, David Nott, in his appearance on Desert Island Discs. It's often the less well known interviewees that make for the most fascinating castaways and he was just so inspiring and humbling when he talked about his annual missions to war zones where he works on a charitable basis as a surgeon. You may need tissues. Discussing it with a friend when I snuck out to join her for breakfast earlier this week, we were both surprised that his view of what was truly remarkable in his extraordinary life was finding a woman who fell in love with him. We also both felt that listening to it had completely changed our perception of the Queen (in a positive way). I really enjoyed reading the late Kent Haruf's Our Souls at Night recently (an author actually recommended to me a few years ago by a reader of this blog - I'm so sorry I can't remember quite who, but thank you!). It's a wonderful story with engaging characters and a very unusual premise for the storyline. Both of my parents have also now read and enjoyed it, so it's a recommendation from three. If you're already a fan of his writing, you may enjoy this feature in Granta Magazine from Kent Haruf on his path to becoming a published novelist. In other thoughts, we booked to go away in England rather than abroad this summer and on the basis of our weather so far I'm now feeling slightly glum about that. It's a rare thing for our family to make any plans at all until just before they happen and this has been a lesson in why I do prefer to live that way - I'm not a person who knows what I'm going to want to do in a few weeks, let alone a few months time and I'm now cursing myself that earlier in the year we had a momentary desire to plan ahead and then miraculously found the efficiency to act upon it! I am really craving some sunshine to warm my bones (and does anyone else really love touching the top of their head on a blisteringly hot day and finding that their hair has retained the same amount of heat as a loaf of bread fresh from the oven? I do. I also love this on my children's heads too. I've also suddenly realised that I have a habit of putting these weird asides in brackets as though by excluding them from the flow of the rest of the post, they may seem more like a small, incidental passing thought than an firm indication of my own self, in case there isn't a single reader who shares such a thought. Even being aware of that, I find myself unable to take it out of brackets. You can mentally remove them if you wish and then tease me for having odd thoughts in the comments)! It seems increasingly to be the case that global warming means we don't really have a summer anymore... just a period where the temperature rises mildly while it continues to rain and a winter also sadly lacking in any extreme other than rainfall. Finally, moving on from my quintessentially British grumbling about weather, I have a new sponsor to introduce. 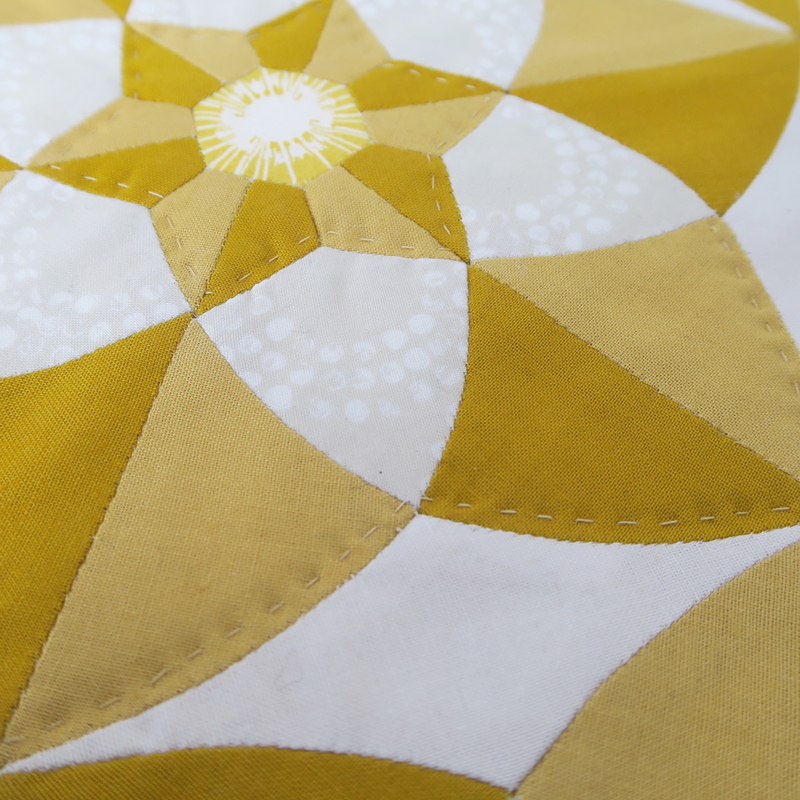 If you ever play around with the idea of designing your own fabric, Prinfab not only allow you to have it printed on a variety of substrates, but you can also sell your designs through their site, like an English version of Spoonflower, which sounds fantastic! Do feel free to leave any of your own random thoughts or recommendations in the comments. Ps. While on the subject of random recommendations: my sister bought me this after I borrowed some from her when we went away together earlier in the year. It really does work. This year, I have the softest feet I've ever walked on (also, returning to bracketed thoughts about how the sun changes the feel of things: when you've been in the garden for hours barefoot on a hot day and then walk back into the house and the normally-fairly-unremarkable-feeling-carpet suddenly feels like velvet! I love that too).